We feature beehive plans, construction tutorials, stories about beekeeping and lots of great photos. Enjoy! 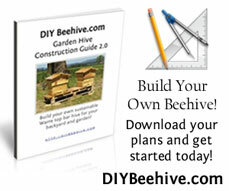 Check out the Beehive Construction Guide that shows you how to build your own beehive. This entry was posted in Site Related and tagged beekeeping, the bee space, Warre Hive, welcome. Bookmark the permalink. What an interesting blog! I’ve always been fascinated by bees. My husband brought up the idea of us having bees, but it looks so complicated. On the other hand, his sister in Oakland, CA went ahead and started about 2 years ago. She had some problems with a neighbor’s fear of bees, but she moved her hive to the other side of her roof and apparently the neighbor is none the wiser. Dare I forward info about your blog to my husband? It does involve some commitment to keep a hive, does it not? Tess – Thanks for your compliments on my blog! Yes, beekeeping does require a commitment of sorts…but in reality it takes more commitment to have a dog or cat than it does to keep bees. Bees are best left alone and that translates into low maintenance for you the beekeeper. They do wonders for gardens and herb plots in terms of pollination. Bees huh? Now that’s an interesting idea. I’ve never really thought a whole lot about bees except when they fly at me. Chris – Thanks for stopping by! Feel free to hang around and learn more about honeybees. This is the first blog I’ve ever read and, fantasically, it’s about bees! Excellent! Nicks quite correct; the less you interfere with bees, the better the results. I have two National Hives but am looking to move the bees over to Warres as the concept appears to be far more sustainable, a lot less traumatic for the bees and a lot less time consuming for me. As there is considerably less manipulation (opening of the hive) with a Warre it means the bees are not having the roof taken off their house, and the furniture inside moved around, every week which must surely strss them out. Therefore, a Warre will be a much better hive to keep in your garden; it’s relaxing to watch the bees, helps the plants, may result in some honey and is a great talking point with friends. I’d fully recommend beekeeping; it’s a fabulous hobby and costs me a lot less than my dog! Tim – Thanks for your kind words! I agree that beekeeping is a fabulous hobby. great site.. looking forward to reading more..
sarah – Thanks for stopping by! I look forward to reading your site as well. I congratulate you on your blog. And I make a call take care of and to improve the life of the bees since they contribute a great value to the human existence for million of yeras, I am a beekeeper born in Argentina, I started to study them at the age of 14 now I am 37. There are aportoda to me a natural form of life. And if some you see by its mind the bees are an example of life to follow to learn of the bees. Thank you very much and good luck. Dario – Thank you for your comment! I agree that we must take care of and improve the life of the bees. By doing so, our own lives will improve. Vern – You could try something like that if you wanted, but it has been my experience that the honeybees do a pretty good job of regulating hive temperature themselves. I think it would be best to just let the bees take care of the temperature. They know instinctively the ideal hive temperature for their own beehive. This is a great photo of bees getting water. I have a similar one somewhere on my hard drive (n0 wasp though). I always watched bees on my pond. In the shallows they would land on algae to get water. I found it very calming to watch the bees come and go. I just wanted to say that I really like the new iPad version of the site.. Nice job!! I’m new to beekeeping and I built my own octagonal top bar hives using inspiration from your site. I’m currently waiting for my package bees so I can get started but I have learned so much about bees and beekeeping here on PTheBeeSpace and I wanted to thank you! I became aware of the plight of the honeybee a few years ago and so I began paying attention to my local situation out of concern. I became increasingly alarmed because I rarely, if ever, saw honeybees around my garden. And so I began doing more and more research about Varroa mites, Tracheal mites, brood diseases and CCD, until I finally decided that the best option was to take matters into my own hands and put in a couple of top bar hives here at my home. I decided to try the octagonal hive because it seemed more natural (in all honesty.. I was going to try to build pdodecagonal hives but felt that it was beyond my woodworking skills) and I wanted to provide the girls as natural environment as I could while still being able to monitor the hive for trouble. So now my hives are built and I await my package bees (Italian/Carniolan cross) and I feel less overwhelmed because of your site and the eloquence of your explanations and observations. For that sir, I thank you and I look forward to more from TheBeeSpace! Thank You Lindsay, I’m glad I was able to help and welcome to the world of natural beekeeping! I DON’T KNOW IF ANYONE CAN HELP ME. I RECENTLY MOVED INTO A TWO STORY HOUSE THAT I’M RENTING. EVERY MORNING WHEN I LEAVE FOR WORK THERE ARE LITERALLY DOZENS OF DEAD BEES ON MY DRIVE WAY. IT HAS ME BOTH PERPLEXED AND SCARED AS I DO NOT KNOW WHAT THE CAUSE IS. I HAVE NOT SPRAYED ANY INSECTICIDES SINCE MOVING IN BUT I DON’T KNOW IF THE MANAGMENT COMPANY DID. IF ANYONE HAS ANY IDEAS AS TO HOW I CAN STOP THIS PLEASE E-MAIL THEM TO avillasenorII@hotmail.com THANK YOU. Sounds to me like someone sprayed, you could contact the property management company and ask them.